Driving in the city or on the interstate is not only challenging but can be extremely stressful for adults in their prime years. As Baby Boomers get older and their reaction time slows compounded with decreased hearing and vision, driving can be one big aggravation. However, according to the Florida DMV, 90% of senior drivers polled said losing their license would be problematic for their lives. This reflection upon the elderly reveals more than the action of driving. As we age, losing control over the things we cherish is very difficult. Our independence is of prime importance to us. We dread becoming a burden to those around us and refuse to wait for a convenient time for them to transport us to important appointments and obligations. The elderly are very aware of the fact that they’re not as reactive as they once were. This is why they often go slower than the speed limit and stop way before the light turns red, but they also don’t drink and drive and speed like some young adults do. However, according to a study in the journal “Traffic Injury Prevention,” intersection crashes accounted for half of the fatalities in accidents among drivers 85 years and older. It revealed that when drivers 70 – 79 years old were involved in intersection collisions they misjudged whether it was safe to precede. Those 80 years old and over simply failed to see the other car. Once the elderly begin having sensory impairment and delayed reaction and judgment, fatalities from accidents rise rapidly. More than one half of U.S. States impose restrictions on license renewals for older drivers. Some require a ”Fitness to Drive” statement from a physician starting at age 70. For most states and highway safety, the goal is to keep older people driving safely as long as they can. When is it time to hand the keys to your family? 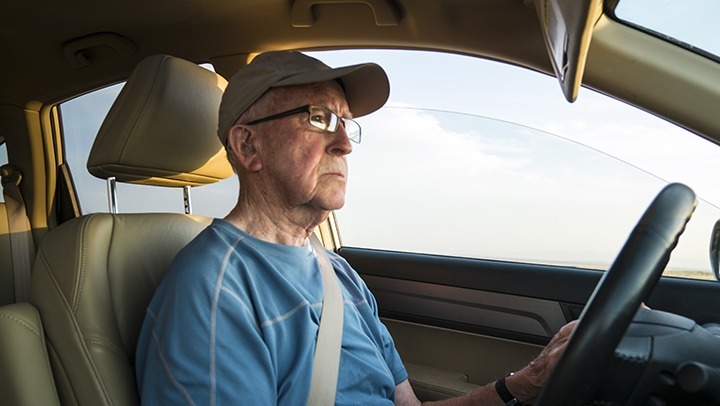 Primarily, when driving is no longer safe for the senior, as well as others on the road. This is especially true for people who have chronic age related conditions such as Dementia, Arthritis and Parkinson’s disease. According to AAA, one in six Americans is 65 years and older. When Parkinson’s or Arthritis causes stiffness that’s so severe that reaction time is prolonged, that is a sign to stop driving. At the age of 85, hearing and vision are significantly decreased and even healthy seniors experience difficulty merging, signaling, and abruptly stopping. According to Albert Einstein College of Medicine, the deciding factor is whether or not one is allowed to drive with children in the car. If the answer is “No,” it’s time to give up driving. Other indicators are: stopping at green lights, getting confused by traffic signals, running stop signs, and sideswiping cars when parking. When older adults refuse to give up their license, family members need to intervene for the sake of the senior’s safety, and others as well. Being empathetic and kind helps with the blow of losing their independence. Involving the senior with making arrangements for transportation services, grocery and pharmacy delivery, and home service providers such as hairdressers help prevent the deep sense of loss. Creating a network of alternative transportation arrangements to give the elderly the sense of control can go a long way to adjusting with this major change. Taking a driver’s license away is a major imposition laid upon the elderly. It has a huge effect on mobility, independence, and dignity. It is up to families, caregivers, and friends to allow this transition to be as easy as possible.